On Saturday 23rd that is this Saturday BingoFest are palying a Big Bingo Event - $10,000 Guaranteed Games. If no one wins, the prize will be increased every three days until its won. 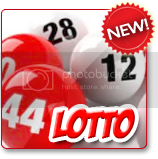 Head for Bingo Lite where there will be £150 guaranteed prizes to be won every 30 minutes! When: Monday Feb 25th - Feb 27th at 1pm, 1.30pm and 2pm. Last Friday was their Birthday and to celebrate they've launched a 200% welcome bonus AND £10 Amazon Voucher offer. This is available until Thursday so be quick! There has never been a better time to deposit at Bingocams. 1) Make your 1st deposit and receive a 200% Automatic Welcome Bonus. 2) Wager £10 or more on Bingo. 3) You will receive an e-voucher for Amazon no later than 4th March 2013. Win some extra BBs each week with Knock, knock Lotto! Any $50 deposit made from Friday through Wednesday, will give you the chance to choose 5 lottery numbers from 1 to 75. Deposit and enter your numbers. US players are welcome on BingoSKY and they also accepts UK Players. Players who deposit for the first time will receive an astonishing bonus of 500%!! All deposits are eligible for cash-back of 25% (Minimum $10-$100 Maximum). Hurry offer valid till March 7th only. Bingo is the happiest place on earth for you and your buddies because you have the chance to win extra cash prizes from Monday 4th to Sunday 10th March! 3 Bingo games will be selected each day and you'll have the chance to win extra cash if you are the Full House winner. Even if you don't win, you'll still get a cash bonus just for playing in that Bingo game! There are now even more happy hours at Foxy Bingo! Take part in the Happy Hour games on MONDAY, TUESDAY, THURSDAY and SUNDAY. Games play from 3pm-4pm and 10pm-11pm you can enjoy an hour of 100% Free and Penny Games in Gimme 5 and Ten Penny Falls. BingoFest will be playing Women's day Bingo on Friday 8th March in the Spring Bingo room from 6pm ET. 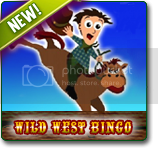 Buckle up cause you are about to embark on a wild ride through Cowboy Country with the Buck'n Bronco Patterns that each hold Jumping Jackpots of up to $100. Enter the Blue Sapphire room every day from 7pm - 8pm to take part! 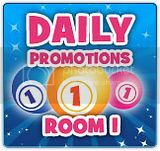 They've got loads of daily specials happening in Room 1! Magic Mondays - the guaranteed prize money increases by £50 every half an hour to a fantastic £1000! Jackpot Wednesdays - guaranteed prize money increases by £50 every half an hour from £650 to a fantastic £1000! Big Games - every Thursday between 7pm - 11pm we have our big £250 games on the half hour and our big £500 games on the hour! Fabulous Fiver – Brilliant Bingo Bonus! Enjoy a £5 Bingo Bonus credited straight to your account when you spend £20 cash on bingo tickets between Monday 11th and Friday 15th March. Players must wager 4x before withdrawing winnings. Winning three matching patterns 3 times during the day and redeem 10 BBs from Live Help. Collect 3 patterns which are same (Ex: 3 Rainbows, 3 Bells, etc.) in a day in any 75 ball bingo room and get freebies from Live Help. Contact Live Help with the coupon code: MATCH3 along with your Game IDs to claim you wins. Make a wish on Wednesday 27th March and the Jackpot Genie might just make it come true! The Jackpot Genie will be granting 25 lucky players' wishes in the Bingo Cafe at 9pm on Wednesday 27th March in his very own Genie Bingo game! A 75-Ball Bingo will be played with a guaranteed £5,000 cash to be won. Tickets are on sale for 50p per ticket with a 60 ticket max per player. Call 1 or 2 lines and you be granted £250 cash. Call 3 or 4 lines and the Genie's magical lamp will gift you £500 cash. Be the first to call FULL HOUSE and you will have all your wishes come true with £2,500 cash. Win a share of £15,000! Pick your favourite Slots character and cheer them on to the finish line to earn an eggciting share of £15,000! 'Pick & Click' on which Slots character you think will win the egg and spoon race, using the arrows to scroll through the potential candidates. Play at least £30 on your chosen character's Slot from now through Thursday 28th March. The winning Slot will be revealed by 5pm on Tuesday 2nd April and £10,000 will be shared with all those that chose that character. Two other characters will also have £2,500 to share. 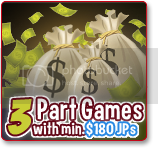 * The only Slots eligble for this promotion are Houdini, Tiki Island and Wonderland. **** Some of the Easter Bingo Specials are still available through today. Spring into bingo cash prizes! Guaranteed $4,000 Every Day on daily Bingo Games! Chocolate Room - The Flower pattern will win you $75 every hour & a super $100 by midnight on the Butterfly pattern. FoS Room – Enjoy our Special 3 Part Games with $10 on each pattern. WHEN –Morning between 9 AM and 11 AM/ DAILY, and evening between 5 PM and 7 PM/ DAILY. Common to all rooms – Just Bingo on the Cover All pattern and get 10 special BBs on the cash prize. Big wins with one line! Today you dab out one line and win a Full House! Check the schedule and play in the games until midnight! Purchase your tickets to win a Full House today! This Tuesday play Double Bubble in the Bargain Basement from 5pm to midnight! Bingo on a double number and win double the prize money. Games take place at 22 minutes past the hour! Every Deposit also enters you for a chance to win a Trip for Two to Australia and a brand new Google Chromebook Laptop! Every Wednesday between 7pm - 9pm there will be a huge bingo party in the private Penthouse room. This weekly treat is at least 15 free bingo games! To qualify for your entry into this private party you must have deposited and staked £10 or more in the previous calendar week (Monday to Sunday). So for next weeks Depositors Party you need to deposit and stake this week. Join them from April 1st April 30th for a chance to win up to $100,000 in Guaranteed contest bingo patterns, 3 night's at The Hilton's Fallsview Resort and $1000 in cash! Play the special patterns in the '$100,000 Niagara Falls Contest' room between 7:00 PM and 11:00 PM for a chance to win entries. Playing slots, keno or video poker can also earn players extra entries into weekly contests! Win your share of £100,000 Monday 15th April - Sunday 21st April! There will be £2,000 up for grabs every 30 minutes. Play in bingo90! from 7:30pm to 10:30pm for your chance to win. Each time you play £30 on Double Bubble Slot or Mini Game between Monday 8th and Sunday 21st you'll earn a Prize Draw entry for a £100 cash prize! One week down but there is always this week! The 50 x Winners will be announced Monday 22nd so start spinning on this bubbly Slot now! Wednesday's in April are for player appreciation! 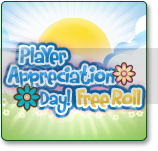 Player Appreciation Day takes place in the Pink Room with the $1,500 Free Roll. Take part in the Bingo Gems Tourney and the top 5 players will share in the £150 prize! The Jackpot Genie will be in the Bingo Café @ 9pm on the last Wednesday of every month. There will be a 75 ball bingo game with a magical twist; the Jackpot Genie will be granting 25 cash prizes. Make a wish on Wednesday 24th April! Try the 3 part game Bingo session with min.$180 JPs every night this week at 8pm in the City Room. Cards are on sale for $0.50 with a max of 24 cards!. The Guaranteed 11PM coverall is NOW $1000 and will go in 52 calls tonight! Receive an EXTRA 100% Bonus on all deposits you make, Monday April 29th, 2013 before midnight. Summer is not far away and bgo Bingo is giving away some of the top men’s aftershaves and women’s perfumes every night! Cards cost just 1p each and the games will be playing at 8.30pm every night until 12 May. Cards are available for pre-buy. Win a £1,000 jackpot in the Grab a Grand Room on May 1st! For those of you that have earned free tickets, they will should be credited to you now. Tickets are available for pre-buy. The Bingo Marathon has $5,000 in total cash rewards during May. From Monday to Thursday there is a bingo marathon with $1,000 up for grabs every week! Tourneys plays from 12 AM, Monday to Midnight, Thursday every week. Enter the marathon with a real money deposit during the marathon. Top 10 players win prizes! Find out what is hidden in Kitty Bingo’s mystery box by purchasing tickets for 5p each. The games play every Thursday night at 9pm. Bingo on the letter M for Mystery and the mystery prize worth £50-£100 is yours! Come join in the excitement and find out for yourself what the box holds! Play new slot Hot Hot Volcano between Tues 7 – Thurs 9. Top 6 wagerers win £50 each! For the bank holiday there is also £600 up for grabs to be shared between 12 lucky winners! THE GREAT BRITISH BINGO BEE CHALLENGE! Each £10 deposit will award you another entry to the draw. Prizes include Amazon Kindle Fire HD and £50 Amazon vouchers to 5 more lucky players each week. Play for guaranteed jackpots of £250 every day from 10am to 10pm plus additional £100 games from 12pm to 2pm and again from 7pm until 10pm. All of the £250 and £100 games take place in the Destination Jackpots room with cards available for just 25p and 50p each. Win a share of £15,000 Cash! Test your memory by taking part in the Cash Conveyor Belt game and you could win your share of this huge cash bonus!